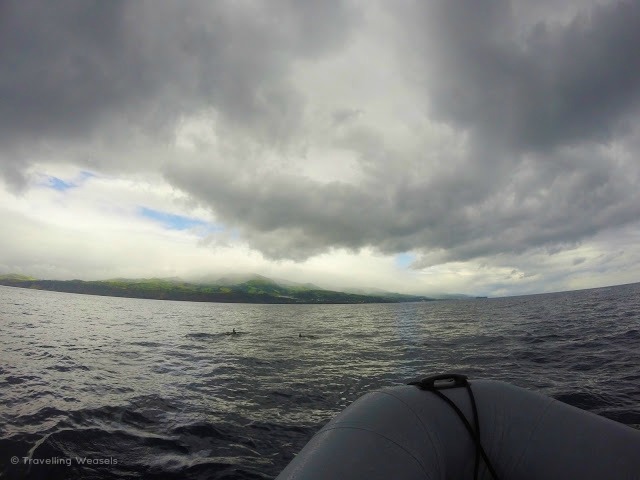 One of the first things that attracted us to the Azores was the chance of seeing whales and dolphins. 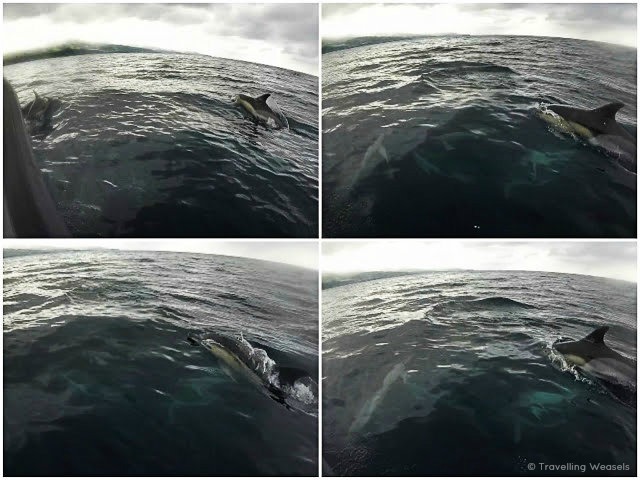 As the Azores are literally in the middle of the ocean, you can see these beautiful creatures at any time of the year! Other companies on the island go out on bigger boats (with bigger engines) which can have up to 60 other people on board! That's not nice for the whales - and incidentally, not nice for the people either: Do you really want to be with a massive group of people all pushing for a front row seat? Or would you rather be with just a handful of others? Picos de Aventuras are working with Monicet which is a research project that wants to build a long term database of cetacean sightings. They are clearly passionate and knowledgeable when it comes to the preservation and protection of the animals - and the environment in general. 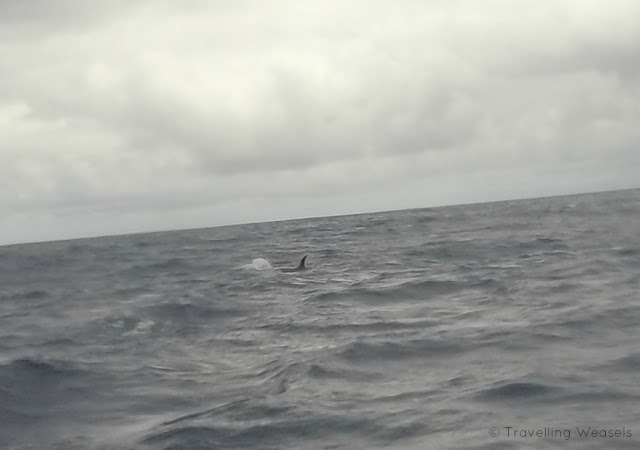 Like I said, the Azores are in the middle of the ocean, so dolphin and whales are very common there. However, the ocean is still massive and the boats are tiny so how do they know where to look? Picos de Aventura employ a clever technique - they have lookouts on the mountains who use military binoculars to spot the whales, then they radio/phone the boat and tell them which direction to go! Despite the commonness of the cetaceans and the cleverness of the binocular plan, there is still a chance you won't see whales - they are wild after all. In this rare case, Picos de Aventura give you the option of coming back on another day free of charge, or having your money back. Which is really cool, a lot of other companies don't do this. 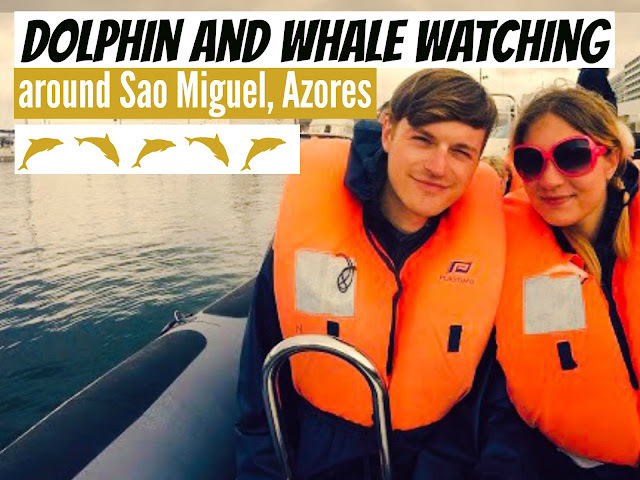 Ultimately, as long as you're at the Azores for long enough, you will see dolphins/whales. By long enough I mean at least a week (but ideally a fortnight - or a whole month like we did ;) ). 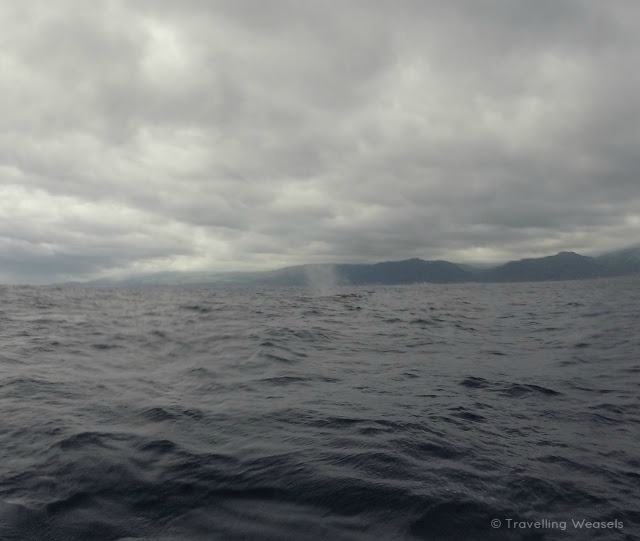 The Azores weather is very volatile and if you come here for just three or four days, yes even in the middle of June, you could get four days of rain and you won't see the whales. 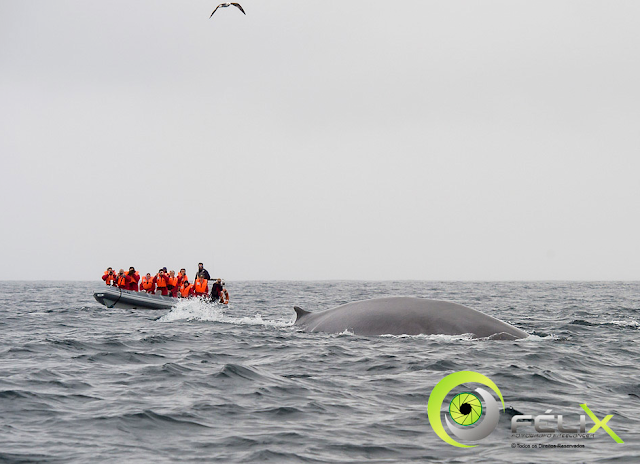 All in all, Picos de Aventura manage to keep everyone happy - they ensure the tourists have the highest chance of seeing the whales, but they also make sure that the whales are kept safe, by keeping the correct distances and forbidding swimming with them. We hadn't been at sea for very long before we saw our first dolphins!! It was so cool to see them in the wild, they came right up to the boat, so the engine was respectfully switched off. There were lots of dolphins and we even saw pups! It really was magical. Next we saw a Portuguese man o' war, apparently named because they look like the old Portuguese ships. Not because they're actually Portuguese. The boat sped towards it and soon we spotted it! 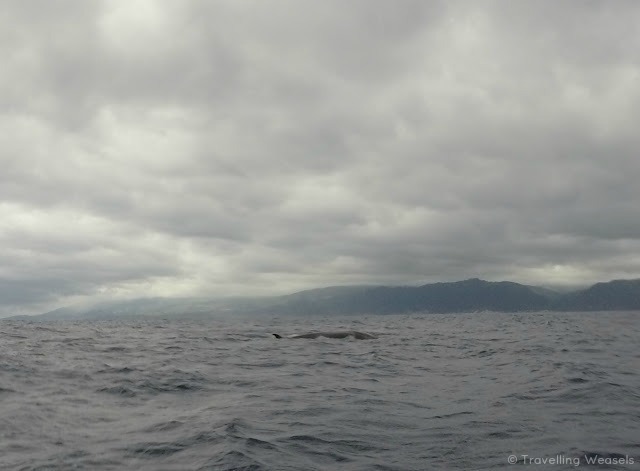 It was a sei whale!! It was so exciting! After ten minutes or so of observing the whale, we turned back to shore. 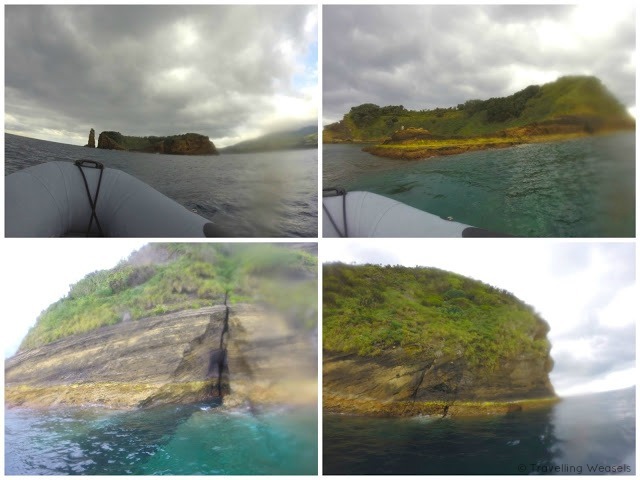 We were quite far from Ponta Delgada at this point, but luckily our guides kept things interesting by showing us the Islet of Vila Franca do Campo - where Red Bull do Cliff Diving! We highly recommend Picos de Aventura - they are by far the best adventure company on Sao Miguel. This was a really exciting, wonderful day. 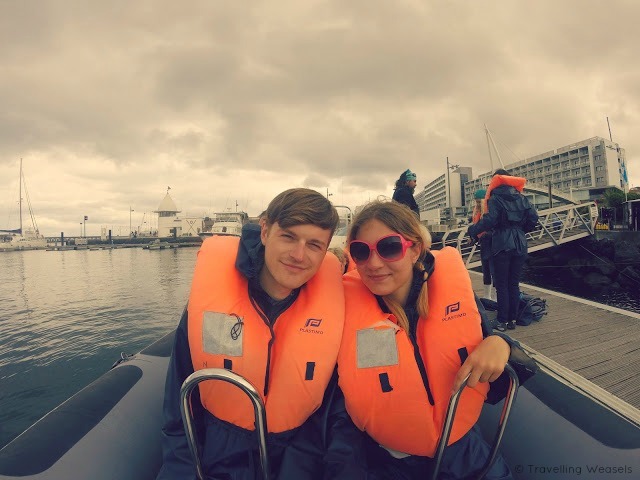 We were in the Azores for one month, this and mountain biking around Furnas with them were our absolute favourite days. If you have limited time on the island, whale/dolphin watch on your first day - that way if you don't see any, you still have time to come back another day! Cheap flights to the Azores - Kiwi is the only site we use when it comes to booking flights. They find unique cheap flights that other websites can't or won't anddd they have 24/7 support. Car Hire in the Azores - there are two transport options in the Azores: care hire or hitchhiking. We were invited on this boat trip as a guest of Picos de Aventura, but, as always, all opinions are our own.